When I, The Gassy Cow, think about what design we should use in this era of high gas prices and global warming I come up with one design. But the problem is that the car makers aren't making these or even considering making these as far as I can tell. I'm only a gassy cow, but the solution seems so clear and I'm not talking about anything radical or futuristic. I propose that the cars of the near future should be SMALL, BIO-DIESEL HYBRID CARS. All of these technologies are proven and are used mostly separately now. They should be put together. Let's discuss each of these technologies. SMALL CARS: Small cars are pretty much the standard in Europe, as they normally require less fueling to afford the ever growing gas prices. They have been dealing with high gas prices for much longer than the United States. 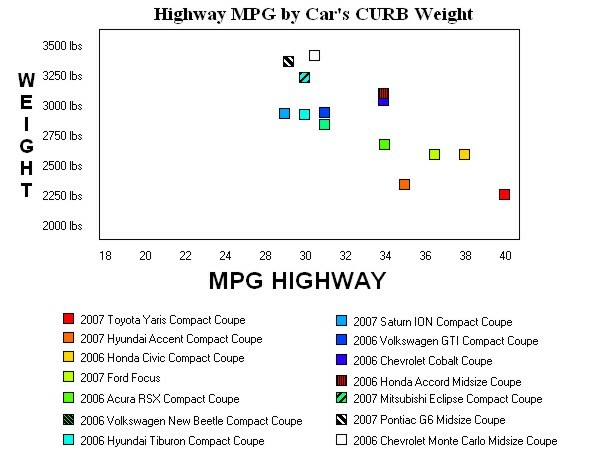 On average the less the car weighs, the better the fuel efficiency. But as you can see this isn't a direct correlation. Efficiency has to do with many factors including the aerodynamic design and other design elements. Greener cars will lead to more consumers buying hybrid and getting off of fossil fuel powered cars. But buying a small car, instead of minivans and/or SUVs is a great first step in fuel efficiency.